As the centre of European culture and institutions, Brussels has much more to offer than most people imagine. Apart from its famous chocolates and beers, there are almost 90 museums, beautiful parks, architecture, bars and much more. Look around our website to learn more. There are two airports close to Brussels city. Zaventem (12 km away) and Charleroi (55 km away). You can get in between these airports and the city by train, bus, taxi and personal car. We provide info on all of these transportation options. 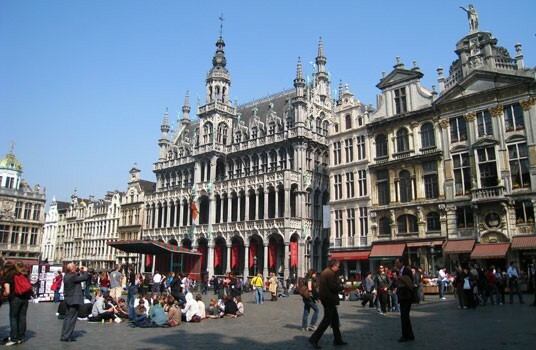 We provide information about availability and prices of all kinds of Brussels accommodation types. Hotels, hostels, apartments, near-airport or luxury accommodation. For the traveler who prefers to see the sights rather than bury his nose in a travel guide, there are guided sightseeing and topic tours available all over Brussels. Most of them have multilingual guides available who speak English, French, German, Dutch, Russian and Arabic. Definitely worth buying. You get free admission to over 30 museums and monuments, discounts at guided tours and even discounts at stores, restaurants and bars. All that for only €22. These two are probably what Belgium is most known for. And what you should not miss. Read more about what and where. Belgium as a whole might be known best for its chocolate and beer, but Brussels itself is most often mentioned in connection with the European Union and other international institutions. Learn the basics on our informative pages.